It’s fun to visit Gettysburg any time of the year, but in the springtime, festival season kicks off. While there is always something to do and something going on in the area, here is a list of Gettysburg’s annual springtime events and festivals that you may just want to plan your trip around. No matter your interests, there’s a festival on the list below for you! These springtime festivals are listed in chronological order – pick your favorite and get ready to make your own history in Gettysburg this spring! We know that vacations can get expensive. After adding up all the costs, something that is supposed to be relaxing can turn into a stressor. The good news is, you don’t have to break your budget to vacation in Gettysburg. 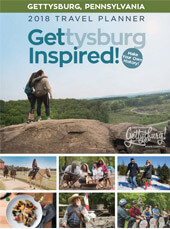 From history to the paranormal and family-friendly attractions to a trail of adult beverages, we’ve compiled a list of things to do for under $20 (per person) in Gettysburg! Which Gettysburg Civil War General are you? When listening to Licensed Battlefield Guides and rangers talk about Civil War generals that fought in the Battle of Gettysburg or seeing their pictures in museums, it’s easy to forget that these generals were real people with normal lives before the Civil War. In fact, they might have been a lot like you. Their distinctive personalities guided them as they made tough calls during the three-day battle that took place in Gettysburg, Pennsylvania. One of the best ways to experience history is to watch it come alive right in front of you. Living historians, encampments and presentations are found throughout Gettysburg starting in spring and usually ending late fall. Dedicated re-enactors embody famous generals, common soldiers and civilians who will engage with spectators giving them a deeper understanding of history. We’ve put together a list of living history hot spots where there’s a good chance you’ll find your favorite Civil War general leading drills or a platoon winding down after a days battle in an encampment.